Everything described here is based on a project I completed in early 2011, which was originally started several years earlier. While attending CanSecWest in 2009, Anibal Sacco and Alfredo Ortega from Core Security did a presentation on "Persistent BIOS Infection" where they demonstrated how it was possible to patch the BIOS to do some nasty/awesome things. Their Phrack write-up is here: http://www.phrack.com/issues.html?issue=66&id=7. At the time this seemed really cool, but I never ended up getting the chance to try it out. A year later I needed to do a term project for school, so I decided to revisit BIOS hacking, and implement some of it myself. Over the past few years a lot has changed in the world of PC BIOS's, and now signed BIOS firmware is standard, and the UEFI architecture changes everything compared to how BIOS's were traditionally designed. Less than a year after I originally completed this project, the first evidence of malware actually infecting a BIOS in a somewhat similar manner was seen (Link). Simple measures such as BIOS update signing would easily prevent these types of BIOS modifications, and some research has also already been done to look at ways around that (such as the presentation on "Attacking Intel BIOS" by Rafal Wojtczuk and Alexander Tereshkin). So it's worth noting that none of what is described here is intended to represent any sort of new vulnerability, but is instead a proof of concept that can easily be tested and modified. My original goal with this project was to determine if BIOS based attacks and malware was feasible, and to actually be able to demonstrate it if it was. I think that goal still has value today, despite new technology steadily making this type of attack less relevant. If nothing else, learning how to do fun BIOS modifications in assembler is great in and of itself, so I've put this project online for others to see as well! If you don't want to read through all of this, and just want to actually try the results out, click here to jump to the bottom for a link to a sample BIOS to try and some brief instructions. Currently there is a very limited amount of sample code available for the creation of BIOS rootkits, with the only publicly available code being released along with the initial BIOS rootkit demonstration in March of 2009 (as far as I'm aware). My first goal was to reproduce the findings made by Core Security in 2009, and then my second task was to investigate how I could extend their findings. My ultimate goal was to create some sort of BIOS based rootkit which could easily be deployed. In 2009 there was research done into a similar area of security, which is boot sector based rootkits. Unlike BIOS based rootkits, developments in this area have progressed rapidly, which has led to a number of different master boot record (MBR) based rootkits being developed and released. This type of rootkit was termed a "Bootkit", and similar to a BIOS based rootkit it aims to load itself before the OS is loaded. This similarity led a number of bootkit developers to remark that it should be possible to perform this type of attack directly from the BIOS instead of loading from the MBR. Despite the comments and suggestions that this bootkit code could be moved into the BIOS for execution, there has not yet been any examples of such code made public. The first stage for completing this project was to set up a test and development environment where BIOS modifications could be made and debugged. In their paper on Persistent BIOS Infection, Sacco and Ortega detail how they discovered that VMware contains a BIOS rom as well as a GDB server which can be used for debugging applications starting from the BIOS itself. After getting everything going successfully in VMware, work was done to port the VMware BIOS modifications to other similar BIOS's, and will be described in the second half of this write-up. Ok, enough background, onto the actually doing it! When initially using this test environment, there were significant issues with IDA's connection to the GDB server. After much trial and error and testing with different GDB clients, it was determined that the version of VMware was to blame. Version 6 and 6.5 do not appear to work very well with IDA, so version VMware version 7 was used for the majority of the testing. 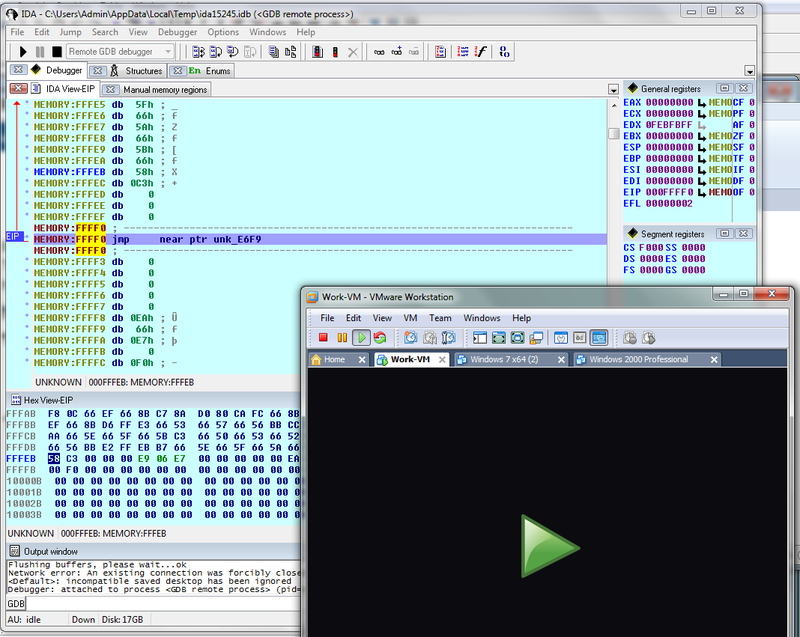 The BIOS is comprised of 16 bit code, and not the 32 bit code that IDA defaults to, so defining "Manual Memory Regions" in the debugging options of IDA was necessary. This allowed memory addresses to be defined as 16 bit code so that they would decompile properly. As noted already, Sacco & Ortega have done two presentations on BIOS modification, and Wojtczuk & Tereshkin have also done a presentation regarding BIOS modification. Of these three presentations, only Sacco & Ortega included any source or sample code which demonstrated their described techniques. Since this was the only existing example available, it was used as the starting point for this BIOS based rootkits project. The paper by Sacco & Ortega is fairly comprehensive in describing their set up and testing techniques. The VMware setup was completed as described above, and the next step was to implement the BIOS modification code which they had provided. The code provided required the BIOS rom to be extracted into individual modules. The BIOS rom included with VMware is a Phoenix BIOS. Research showed that there were two main tools for working with this type of BIOS, an open source tool called "phxdeco", and a commercial tool called "Phoenix BIOS Editor", which is provided directly by Phoenix. The paper by Sacco & Ortega recommended the use of the Phoenix BIOS Editor application and they had designed their code to make use of it. A trial version was downloaded from the internet and it appears to have all of the functionality necessary for this project. Looking for a download link again I can't find anything that seems even half legitimate, but Google does come up with all kinds of links. I'll just assume that it should be fairly easy to track down some sort of legitimate trial version still. Once the tools are installed, the next step is to build a custom BIOS. I first tested that a minor modification to the BIOS image would take effect in VMware, which it did (changed the VMware logo colour). Next, I ran the Python build script provided by Sacco & Ortega for the BIOS modification. Aside from one typo in the Python BIOS assembly script everything worked great and a new BIOS was saved to disk. Loading this BIOS in VMware however did not result in the same level of success, with VMware displaying a message that something had gone horribly wrong in the virtual machine and it was being shut down. Debugging of this issue was done in IDA and GDB, but the problem was difficult to trace (plus there were version issues with IDA). In an effort to get things working quickly, a different version of VMware was loaded, so that the test environment would match that of Sacco & Ortega's. After some searching, the exact version of VMware that they had used was located and installed. This unfortunately still did not solve the issue, the same crash error was reported by VMware. While I had seen this BIOS modification work when demonstrated as part of their presentation, it was now clear that their example code would require additional modification before it could work on any test system. Many different things were learned as a result of debugging Sacco's & Ortega's code, and eventually the problem was narrowed down to an assembler instruction which was executing a far call to an absolute address which was not the correct address for the BIOS being used. With the correct address entered the BIOS code successfully executed, and the rootkit began searching the hard drive for files to modify. This code took a very long time to scan across the hard drive (which was only 15gb), and it was run multiple times before the system would start. The proof of concept code included the functionality to patch notepad.exe so that it would display a message when started, or to modify the /etc/passwd file on a unix system so that the root password would be set to a fixed value. This showed that the rootkits can be functional on both Windows and Linux systems, even if only used for simple purposes. While significantly later on in the project time line, the functionality of various bootkit code was also tested, and the results recreated to determine which would work best as not just a bootkit, but also a BIOS based rootkit. Four different bootkits were examined, the Stoned, Whistler, Vbootkit and Vbootkit2 bootkits. The Stoned and Whistler bootkits were designed to function much more like malware than a rootkit, and did not have a simple source code structure. The Vbootkit2 bootkit was much different, as it was not designed to be malware and had (relatively) well documented source code. This bootkit was designed to be run from a CD, but only was tested with Windows 7 beta. 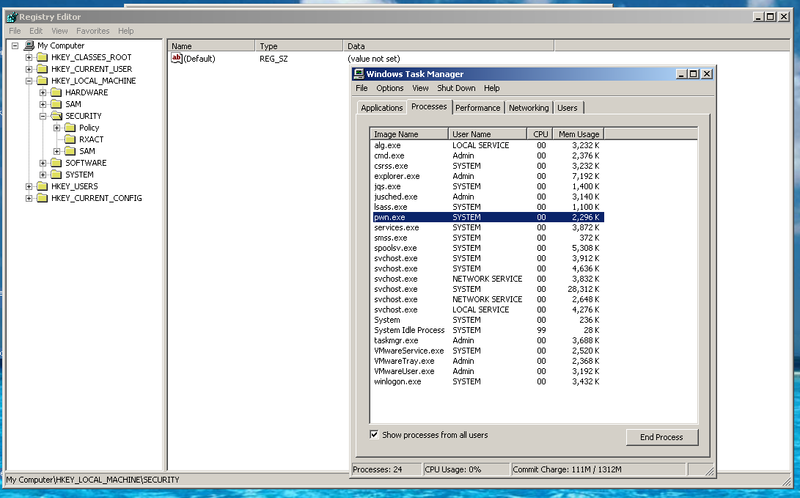 When used with Windows 7 retail, the bootkit simply did not load as different file signatures were used by Windows. Some time was spent determining the new file signatures so that this bootkit could be tested, but it would still not load successfully. To allow for testing a beta copy of Windows 7 was obtained instead. When the Vbootkit2 software was run on a Windows 7 beta system, everything worked as expected. The Vbootkit2 software included the ability to escalate a process to System (above admin) level privileges, to capture keystrokes, and to reset user passwords. These were all items that would be valuable to have included in a rootkit, but significant work remained to port this application to Windows 7 retail. The Vbootkit software was examined next; it was designed to work with Windows 2003, XP and 2000. While it was not packaged so that it could be run from CD, only minor modifications were required to add that functionality. This software only included the ability to escalate process privileges, but that alone is a very valuable function. This bootkit software was chosen for use with the BIOS rootkit, which is described in the next section. NVLabs (http://www.nvlabs.in/) are the authors of the bootkit itself, which in many ways represents the main functionality of this project, so a big thanks to them for making their code public! It appears their source code is no longer available on their website, but it can still be downloaded from Archive.org here. The proof of concept code by Sacco & Ortega which was previously tested was very fragile, and its functions were not the type of actions that a rootkit should be performing. The first step in developing a new rootkit was to develop a robust method of having the BIOS execute additional code. Sacco & Ortega patched the BIOS's decompression module since it was already decompressed (so that it could decompress everything else), and it is called as the BIOS is loaded. This reasoning was appropriate, but the hooking techniques needed to be modified. During normal operation, the BIOS would call the decompression module once for each compressed BIOS module that was present. The VMware BIOS included 22 compressed modules, so the decompression code was called 22 times. This module will overwrite our additional code as it resides in buffer space, so it is necessary to have our addition code relocate itself. Insert a new call at the beginning of the decompression module to our additional code. Copy all of our additional code to a new section of memory. Update the decompression module call to point to the new location in memory where our code is. Return to the decompression module and continue execution. xor ax, ax				; (This may or may not be obvious, but xor'ing the register sets it to 0). ; loaded would be required in advance (so it could be hard coded), which is not a good solution as it differs for every system. ; The code has now been relocated and the calling function patched, so everything can be restored and we can return. ; The following instructions were overwritten with the patch to the DECOMPC0.ROM module, so we need to run them now before we return. Once the above code is executed, it will copy itself to memory offset 0x8000, and patch the instruction which initially called it, so that it will now point to 0x8000 instead. For initially testing this code, the relocated code was simply a routine which would display a "W" to the screen (see screenshot below). The end goal however was that our rootkit code could be called instead, so the next modification was to integrate that code. Our BIOS based rootkit code will run somewhere in between the BIOS Entry and the BIOS Loading Complete stages. A bootkit would instead run at the last stage, starting from 0x7C00 in memory. The VBootkit software was designed so that it would be loaded into address 0x7C00, at which point it would relocate itself to address 0x9E000. It would then hook interrupt 0x13, and would then read the first sector from the hard drive (the MBR) into 0x7C00, so that it could execute as if the bootkit was never there. This process needed to be modified so that all hard coded addresses were replaced (as the bootkit is no longer executing from 0x7C00). Additionally, there is no need to load the MBR into memory as the BIOS will do that on its own. The VBootkit software hooks interrupt 0x13, that is, it replaces the address that the interrupt would normally go to with its own address, and then calls the interrupt after doing additional processing. This turned out to require an additional modification as when our BIOS rootkit code is called interrupt 0x13 is still not fully initialized. This was overcome by storing a count in memory of how many times the decompression module had been run. If it had been run more 22 times (for 22 modules), then the BIOS was fully initialized, and we could safely hook interrupt 0x13. The modification made to the bootloader will cause it to modify the Windows kernel. This in turn will allow arbitrary code to be injected into the Windows kernel, allowing for the privilege escalation functionality. 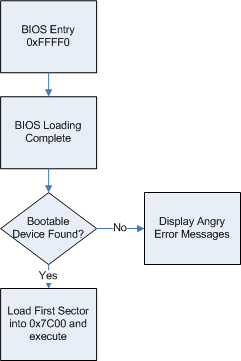 The BIOS rootkit which has been developed could definitely include more functionality (such as what is included in Vbootkit2), but still acts as an effective rootkit in its current state. # that NASM be present on the system it is run on. # as an argument on the command line. # so that it will run the BIOS rootkit asm code. # or this will fail! #the normal decompression functions can continue. # The following would work but is an absolute call, not ideal! # easier to identify where the modification has taken place. # Pad an additional 10 NOP's at the end. print "The DECOMPC0.ROM file has now been patched." The DECOMPC0.ROM file has now been patched. For raw BIOS files, such as the one included with VMware, a number of command line utilities included with the Phoenix Bios Editor (or available from Intel) can be used to reassemble everything. Later on when testing with a real PC it was necessary to save the BIOS in more than just the raw format, so the tool for reassembly used was the GUI version of the Phoenix Bios Editor. This unfortunately means that it is not possible to simply have one application that can be run on a system which will infect the BIOS, at least not using off the shelf tools. The Phoenix BIOS Editor is not specifically designed for swapping modules in and out, but does effectively allow for it. When a BIOS image is first opened, all of the BIOS modules will be extracted to disk in a folder located at C:\Program Files\Phoenix BIOS Editor\TEMP\. The decompression module can be copied from this folder, patched, and replaced. The Phoenix BIOS Editor will not allow you to save a BIOS without a modification, so it is necessary to modify a string value and then change it back (or just leave it) so that the BIOS can be saved. The BIOS based rootkit source code and patching scripts can be downloaded from the links near the end of this write-up if you would like to try all of this out yourself. The first step to modifying a real system BIOS is to extract a copy of it. Phoenix has two different tools which they generally provide for this purpose, one is called "Phlash16", and the other is called "WinPhlash". Phlash16 is a command line utility (with a console based GUI), but will only run from DOS. WinPhlash, as its name suggests, runs from Windows. While this is a GUI based utility, it will also accept command line options, allowing us to automate the process of BIOS retrieval. For this project I ended up making some scripts to automate BIOS extraction and patching, but they're quite basic and limited. The following batch script will copy the BIOS into a file named BIOSORIG.WPH, and then check if it has previously been modified. The CheckFlash.py Perl script simply checks the BIOS contents for my name, which would not be in any unpatched BIOS. @rem This file dumps the bios and checks if it has previously been patched. With the BIOS retrieved, the next step is to patch it with our rootkit code. This can be done using the exact same scripts that we used for VMware in the sections above. It was a goal of this project to design the patch as well as the patching process to be as compatible as possible. I am quite pleased that this turned out to be completely possible, so that the same tools can be used for completely different hardware running the same type of BIOS. While there is a free tool which can extract modules from Phoenix BIOS's, it appears that only the Phoenix Bios Editor will reassemble them as needed for typical PC's. 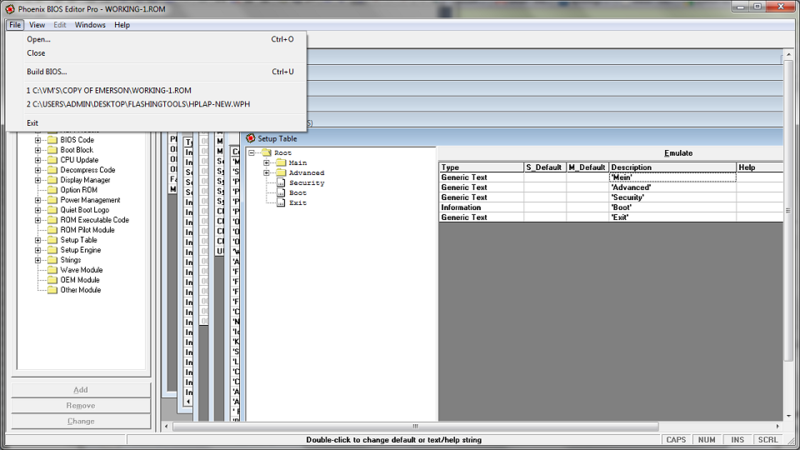 The WinPhlash tool requires additional information to be included with the BIOS, which it stores along with the raw BIOS in the WPH file. After testing many different options, it appears that the only way to successfully reassemble the WPH file is to use the GUI Phoenix Bios Editor. This unfortunately means that it is not possible to simply have one application that can be run on a system which will infect the BIOS, at least not using off the shelf tools. Theoretically it should be possible to reverse engineer the WPH format and create a custom BIOS reassembly tool, but this was out of the scope of this project. Instead, the BIOS infection is a three stage process, requiring some manual intervention mainly for the reassembly. As with patching the VMware BIOS, the same trick to have the Phoenix BIOS Editor reassemble a patched module can be used. When a BIOS image is first opened, all of the BIOS modules will be extracted to disk in a folder located at C:\Program Files\Phoenix BIOS Editor\TEMP\. 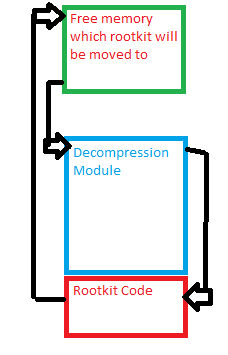 The decompression module can be copied from this folder, patched, and replaced. The Phoenix BIOS Editor will not allow you to save a BIOS without a modification, so it is necessary to modify a string value and then change it back (or just leave it) so that the BIOS can be saved. @rem This file uploads a file named "BIOSPATCHED.WPH" to the BIOS. Will reboot system when done. This demonstrated that the BIOS rootkit was portable enough to work on multiple systems (VMware, the HP laptop), and that the infection mechanisms were functional and working properly. The "rootkit" developed for this project only implements one simple task, but as noted regarding the Vbootkit2 software, there is no reason additional functionality cannot be added to this. BIOS's made by Phoenix were examined for this project, and it is likely that there are many similarities between Phoenix BIOS's and BIOS's from other manufacturers. While it is likely that code will need to be created for each separate manufacturer, there are not a large number of different BIOS vendors, so expanding this rootkit functionality to all of the common manufacturers should be feasible. In the introduction I noted that new BIOS features, such as signed BIOS updates, make much of what is described here far less of an issue from a security standpoint. That is definitely good to see, but it is also worth remembering that there are more "legacy" computers out there than there are "new" ones, so this type of attack will still remain an issue for quite a while to come. The following source code, and patched BIOS is provided as a proof of concept. It is in no way my intention that people take this and use it for any malicious purposes, but rather to demonstrate that such attacks are completely feasible on older BIOS configurations. I do not expect that it is very feasible to take this in its current form and turn it into any sort of useful malware, and based on that I am posting this code online. You will need NASM to compile the code to patch into the BIOS if you are using the above scripts / source code. NASM should either be added to your path variable, or you should update the patching script to have an absolute path to it for it to work successfully. You will also need a copy of the Phoenix BIOS Editor, or a free tool equivalent to combine the decompression module back into a complete BIOS. If you don't feel like reading through the whole write-up above, here is the summary of how to try this out, and what it does. First, download the BIOS_rootkit_demo.ROM BIOS image from the above link. To try it, you need a copy of VMware installed, and a guest Windows XP operating system to test with. I've personally tested this with a bunch of different versions of VMware Workstation, as well as the latest version of VMware Player (which is free). I am also told that VMware Fusion works just fine too. 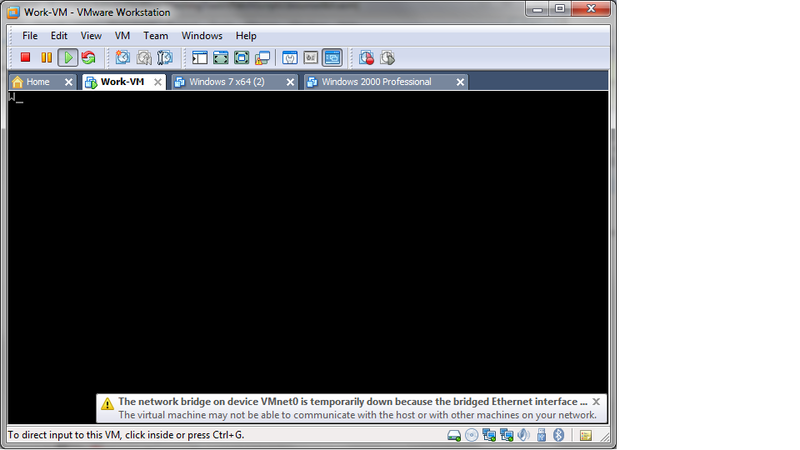 Before opening your guest WinXP VM, browse to where you have the VM stored on your computer, and open the .vmx file (ie WindowsXP.vmx or whatever your VM is called) in notepad. Add a new line at the end that matches the following: bios440.filename = "BIOS_rootkit_demo.ROM". Make sure you copy BIOS_rootkit_demo.ROM to that folder while you're at it. 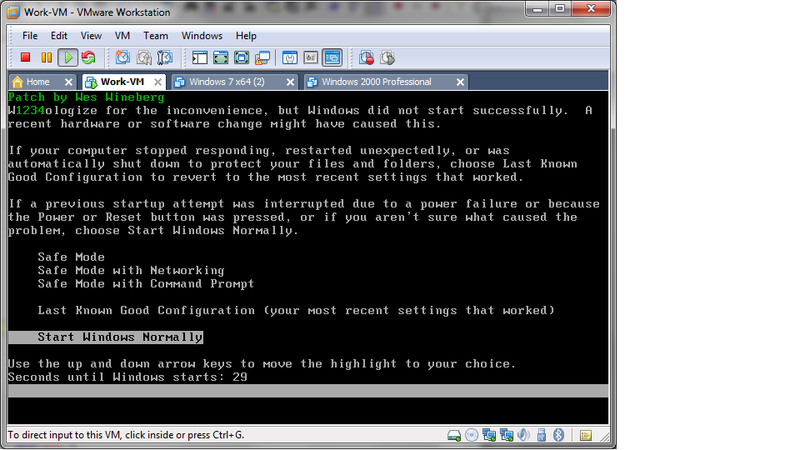 Now open and start the VM, then rename a program to pwn.exe (cmd.exe for example). Wait 30 seconds, and then start the Task Manager. Pwn.exe should be running as user "SYSTEM" now instead of whatever user you are logged into XP with. The list of steps described above should work in an ideal world. Testing has shown the following caveats however! OS instability. Sometimes when booting or just simply closing your pwn.exe application Windows will BSOD. Task Manager will lie about your process user if you open it in advance of the 30s permission escalation time. Use something like cmd with whoami to properly check what your permissions are. While I have loaded this successfully onto a real PC, I take no responsibility for the results if you do the same. I'd love to hear about it if you brick your motherboard in some horrendous way, but I probably won't actually be able to help you with it! Use at your own risk! If you just want to watch a video of what this does, Colin has put one up on YouTube: http://www.youtube.com/watch?v=5bxb3e9p3kA. I recommend actually trying it in VMware, it's way more fun to see a hard drive wipe do nothing, and your system still affected!